Climate change continues to be debated or even doubted by some, but excessive levels of carbon dioxide are already causing a widespread threat to many forms of marine life. Ocean acidity is rising as sea water absorbs the vast amounts of carbon dioxide emitted by power plants and automobiles. The higher acidity threatens all marine life, but particularly corals and shellfish, which may become extinct later this century from the chemical effects of CO2. 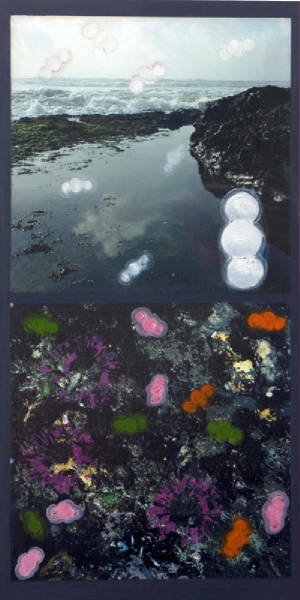 In this series, the CO2 molecules are made visible in images of tide pools and the intertidal zone. Additional threats to sea life posed by polyethylene bags and water bottles are also visualized in molecular or abstract form. Sea Oh Too, Triptych Left, 2011. 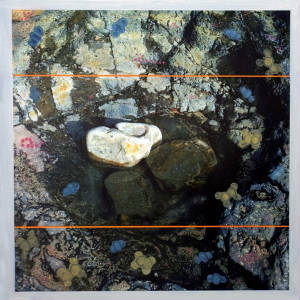 24 x 24 x 2"
Sea Oh Too, Triptych Center, 2011. 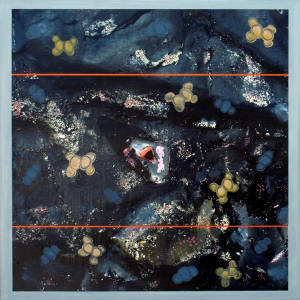 24 x 24 x 2"
Sea Oh Too, Triptych Right, 2011. 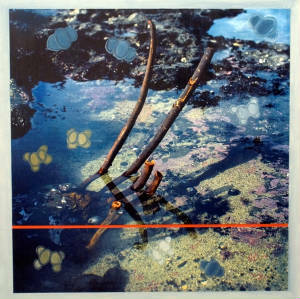 24 x 24 x 2"
Sea Oh Too, Diptych 01, 2011. 24h x 12w x 2d"
Sea Oh Too, Diptych 02, 2011. 24h x 12w x 2d"